The most important benefit is the safety that a low voltage landscape lighting system provides. Such a system makes use of a step down transformer to bring down the voltage the normal 120 volts to 12 volts. This considerably reduces the chances of short circuits. However, installation of low voltage landscape lighting at proper positions, taking into account the wet and moist conditions of the garden, is very important. The installation of a low voltage landscape lighting system is very easy and does not require an electrician. No special tools are required and the services of a certified electrician may not be required. Although this is a fairly simple process, we recommend that you contact us to ensure that your low voltage landscape lighting is installed properly without any hastles or confusion. Low voltage landscape lighting systems consume less current and hence are more cost effective. The fixtures required for low voltage landscape lighting are smaller and hence they blend with the landscape. Adjustment of lighting for altering landscapes or replacement of lighting after a period of time will not cost you much. Low voltage landscape lighting provides better color quality for your property. Low voltage light bulbs do not have mercury in them. 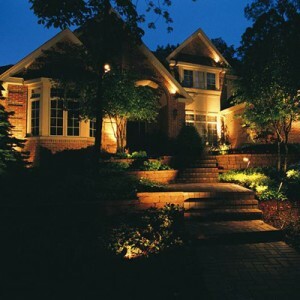 Another major benefit of low voltage landscape lighting is for more security of your property. The landscape lighting with provide more light around your property at night and this could deter break ins and enhance security. Specially manufactured LED lights and fixtures are used for outdoor and landscape lighting because of their longer life and energy efficiency. LED landscape lighting is safer and more reliable compared to traditional low voltage halogen lighting. By changing over to LED lights, energy consumption to the tune of 90% of the requirement for conventional lighting can be saved. LED lights have a life span of 60,000 hours and their performance is excellent even in cold weather conditions. It is possible to control the intensity of the LED light and create the required mood. LED lights turn on immediately and come to full brightness. LED lights generate very little heat. Snow may collect on the light during winter season and cause problems. It is, therefore, important to select a light fixture that does not allow collection of snow during winter season. Low voltage LED landscape lighting is the best option however you look at it. Call Riemer and Son Landscape at (405)639-7648 to schedule your free consultation on how we can help you enhance your lanscaping by using low voltage landscape lighting.